The Galway summer festival, one of the social and sporting highlights of the summer, kicks off on Monday July 28. With a prize fund of more than €1.6m for owners, trainers and jockeys across the 52 races, the seven-day festival is the most popular race events in the country. Along with the investment from Guinness, recently extended to another five years, sponsors this year include Topaz, Tote, Latin Quarter, Ladbrokes, Easyfix, Colm Quinn BMW, EBF, Trappers and the Athlone Town Centre shopping centre. Galway hotels are sponsoring the opening day of the meeting on Monday July 28 – Radisson Hotel, Galway Bay Hotel, Claregalway Hotel, Clayton Hotel, Pillo Hotel – with the feature race of the evening, the qualified riders handicap, sponsored by the Connacht Hotel. 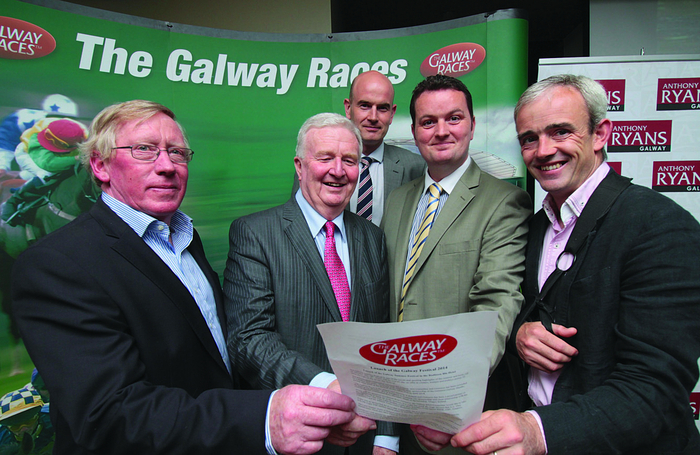 At the launch of this year’s Galway summer festival in the Radisson Hotel, racecourse chairman Terry Cunningham said all of the races were sponsored throughout the week. Chanelle Veterinary is back on board again this year to sponsor the Leading Trainer prize, which was won last year by Dermot Weld for the 27th time with 11 winners throughout the week. The leading jockey award will be sponsored by Rooney’s Galway with an individual prize for the leading flat and national hunt riders throughout the week, while the best turned out prize will be sponsored by Paddy Power bookmakers. The Best Dressed Person competition takes place on what is traditionally known as Ladies’ Day on Thursday, July 31, and is sponsored by Anthony Ryan Ltd of Shop Street, Galway, to be judged by Lisa Fitzpatrick. Last year saw the introduction of the Friday’s Fair Lady competition and this year’s event will be judged by well-known stylist Marietta Doran on August 1. The Ladbrokes Red Day takes centre stage on Saturday, August 2, and offers fantastic prizes for the lady with a red element to her outfit. Family Day and Mad Hatters Day brings the festival to a close on Sunday, August 3. The Mad Hatters competition is hugely popular, with the effort and creativity of the entrants being rewarded by Ireland West Airport Knock.